Part of Facebook’s draw in being such a transformational media platform for advertisers lies in its global connectivity. 75 percent of Facebook’s 845 million active users live outside the United States, with the social network supporting 70 different languages. The United States, with the largest square, has the greatest number of targetable Facebook users of any country. 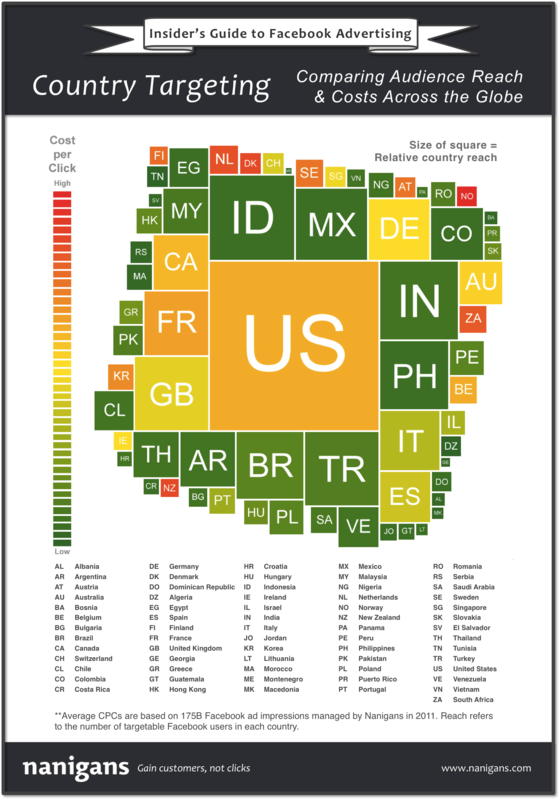 Given this extensive reach, we benchmarked average CPCs for other countries in this infographic against the United States. Indonesia stands out as the country with the largest reach next to the United States, and these users are relatively inexpensive to target, as indicated by its dark green color. On the opposite end of the spectrum, there are a very small number of targetable Facebook users in Norway and they are very expensive to target. As you’ll learn from infographics we’ll release in the near future, although Norway users are expensive to target, they also represent an audience with a high degree of purchase affinity and ROI.